China and a few other eastern countries have a different calendar to the rest of the world. Working on the lunisolar Chinese Calendar; Chinese New Year falls somewhere between 21st January and 20th February each year. Each year in the Chinese Zodiac – a 12-year cycle – represents an animal. These are: Rat, Ox, Tiger, Rabbit, Dragon, Snake, Horse, Goat, Monkey, Rooster, Dog and Pig. One of the main superstitions the Chinese follow is to completely clean their home in time for the New Year. In particular, they focus upon sweeping the floors as it’s said that this eliminates "bad energy" from the home. It’s a metaphor for eliminating the old and welcoming in the new. It’s said that whatever happens on the first day of the New Year will determine how the rest of the year pans out. So, things like foul language and putting people down are frowned upon. On a similar note to the point above, children and adults are not allowed to tell ghost stories on Chinese New Year. This is because they relate to death and negative energy. A rather odd superstition the Chinese follow on New Year’s Day is the fact they don’t wash their hair. It is said that by washing the hair on this particular day, it eliminates good luck from the body. Black clothing is something else that relates to death, so its best avoided on New Year. Broken crockery is considered to be a sign of extreme bad luck on New Year’s Day. So be careful with those plates! As the point made earlier, the Chinese believe that anything which happens on New Year’s Day will happen for the rest of the year. Therefore if you cry, you will end up crying for the rest of the year. Red is considered to be a very lucky colour at this time of year. Parents reward their children with cash given in red envelopes. You’ll also often see families enhancing the home with red decorations. Another of the rather strange superstitions the Chinese have at New Year is that nothing should be cut. It’s said it will have a negative impact on your fortune and your life. There’s a myth surrounding this superstition in the form of a creature. It’s said that a half lion and half dragon monster used to come down from the mountains to scare the humans. Firecrackers are used to frighten this mythical beast and show that the people are no longer scared. The above list of Chinese New Year customs was compiled and supplied by My Favourite Voucher Codes, a voucher code website that raises money for good causes by donating 20% of its net profits to charity as well as aiming to help consumers to save money. 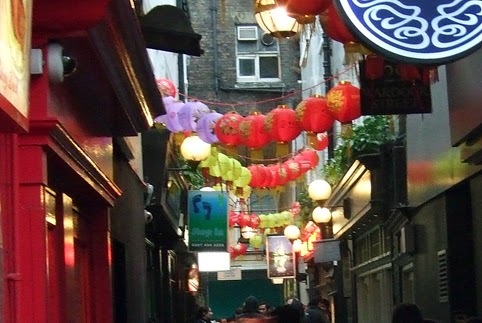 The photo at the top shows lanterns at London's Chinese New Year celebrations. I Finally got round to reading about 20 blog posts i had bookmarked and will post a link of three of your posts onto mine leading of course back to yours. Hmmm, no black clothes, makes it hard for witches, and red is not my color being Scots-Irish of light skin, but I did cut open some mail, bad me. I did clean my house expecting company today that had to cancel. Blessed Chinese new year and yesterdays new moon and upcoming Candlemas!.